Sheboygan's lake traffic is one of the significant features of the city as a business mark and manufacturing center. The mouth of the Sheboygan river was early recognized as a splendid natural harbor and was given especial attention by congress in 1836, when government officers prosecuted surveys and soundings, from which a chart was made of the river's mouth and the bay. A report was subsequently made by Colonel Albert to the war department, and the chart was submitted, but no material action was taken by the Federal authorities until 1840, when a lighthouse was built on north Sheboygan point, which was kept by a Mr. Wolverton. This building stood for twenty years and was replaced by a more modern one in 1860 and some years thereafter was placed in charge of Mrs. E. Pape, wife of Louis Pape, a Civil war veteran, who had sustained a serious accident by the bursting of a cannon upon the occasion of a Fourth of July celebration. This lighthouse remained in commission until the present one was built, opposite Pennsylvania avenue. The first pier, a crude affair, was built and owned by William Farnsworth. The structure ran out from Center street, north of the mouth of the Sheboygan river. In 1845, ^o^r years later, the pier was extended to a total length of 800 feet. The next improvement for water traffic was the Kirkland pier, built south of the river in 1848, but in the spring of 1852 a terrific gale of wind swept both the piers into the lake. They were almost immediately rebuilt, however, and were ready for the business that was constantly increasing. They answered the purpose expected of them until the building of a harbor in the river. It was after many attempts of the citizens had been made and yards and yards of red tape had been spun by national legislators before anything definite and tangible had been secured toward harbor building at Sheboygan. In the winter session of congress in 1844-5, an appropriation of $25,000 had been made for the improvement of navigation over the bar at the mouth of the Sheboygan river, but President John Tyler failed to sign the measure and, consequently, it died "abornin." 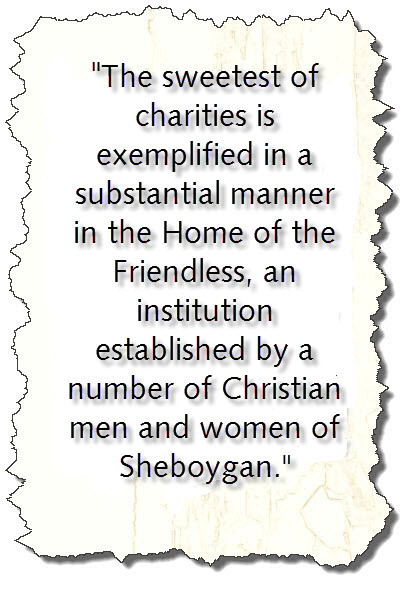 In 1849, the need of financial assistance from the government had become so imperative that a committee of Sheboygan business men prepared a memorial to congress, setting forth various reasons why a harbor should be constructed at this port. Among other things the memorial detailed the astounding fact that every vessel owned at this port had been stranded or wrecked, entailing a loss to the shipping interests approximating the cost of improvements sought. A list of nine vessels was given which were wrecked while lying at anchor in the bay and the further fact was shown that several lives were lost in the disasters enimierated. As showing that the shipping business had assumed sufficient importance to demand better facilities, it was demonstrated that in 1847 the arrivals and departures of steamers alone, without taking note of sailing vessels, was 443, and in 1848 the number had increased to 525. The arrival of immigrants at the port of Sheboygan was 1,417 in 1845, 4,380 in 1846, 4,228 in 1847, and 6,200 in 1848, the year of the great exodus from Germany to the United States. The imports of merchandise in 1848 to Sheboygan amounted to the no inconsiderable amount of 2,859, the estimated value of which was $571,800. The exports included 986 barrels of pork, 5,015 bushels of wheat, besides vast quantities of lumber, shingles, cord wood, wool, etc. On the 5th day of January, 1852, a mass meeting of citizens was held, W. R. Gorsline presiding and Edward Gilman acting as secretary. The object of the meeting was to discuss what measures should be adopted to secure the construction of an adequate harbor at Sheboygan and it was there and then decided to call a delegate convention. In pursuance thereof, a convention was held on the 22nd day of January, following, wherein one hundred and thirty-one delegates responded to their names upon roll call. Silas B. Stedman had been placed in the chair and vice presidents selected from the various towns represented. The result of the deliberations of this body were as follows: Congress being then in session, a request was presented before the House of Representatives, in which the government was asked to appropriate $30,000 for the construction of a harbor at Sheboygan. This the congress acceded to. Another result was the petitioning of the county to appropriate $20,000 for a like purpose and also the city was asked to give $10,000. The legislature passed an act empowering the county and city to raise the amounts desired, and A. P. Lyman, Henry Stock, Charles D. Cole, Jonathan Seeley, A. G. Dye, Reed C. Brazelton and John Gore were appointed harbor commissioners. February 20, 1852, the first contract was let for work on Sheboygan's harbor and since that time, at certain periods, appropriations have been made for harbor improvements, which total at this time the sum of $600,000. On December 1, 1873, a lighthouse was built on the north pier of the harbor, which was burned March 17, 1880. A new building took its place June 20th following, and J. L. Mallory was placed in charge. The present lighthouse keeper is G. M. S. Hansen. The first vessel built in Sheboygan was the small schooner, "Pilot." It was put on the ways by Captain Powell and launched in 1845. This was the beginning of a large and profitable industry in Sheboygan and boat building was long continued here. In 1855 a steam dredge was built for the city, which was kept in commission and ran two years. However, some years since the ship yards were removed and the construction of vessels has ceased at this port. Many vessels touch at this port and a number of them, including tugs, are owned here. The John P. Reiss, one of the largest steel clad propellers on the great lakes, was launched at Loraine, Ohio, January 29, 1910, Mrs. John P. Reiss performing the time-honored ceremony of its christening. The John P. Reiss is one of the leviathans of the inland waters of this country, its measurements being 524 feet long, 56 feet in width and 30 feet in depth ; capacity, 10,000 tons. The vessel is owned by the Wisconsin Transportation Company, of which John P. Reiss, of Sheboygan, is secretary and treasurer. The United States Life Saving Station was established at Sheboygan in 1876, and a fair sized station house erected on the south side of the Sheboygan river at a spot now occupied by docks No. 1 of the C. Reiss Coal Company. The building contained the life saving apparatus and served as a meeting place of the crew. The apparatus consisted of a self-raising boat, two surf boats, a mortar, used to shoot a line to vessels in distress, and such other paraphernalia as life preservers, ropes, etc., which necessity required. The crew, commanded by Captain Oley Groh, consisted of eight volunteers, mostly fishermen. This little band of heroes who, without expectation of reward, risked their lives in order to save the lives and property of others had the following membership: Captain Oley Groh; Henry Groh, Harry Hine, Charles Lamphere, John Gass, Charles West, Oley Ellison, Erich Nelson and Hans Hansen. In fair weather the men attended to their private affairs but as soon as a storm loomed up they hastened to the station, to be in readiness when their services were required. In 1880, however, the station was placed upon a "paid basis" and with that innovation came the establishment of the "look-out" and the "shore patrol." From that time on, the members of the crew gave their entire time to the duties of their positions and spent night and day at the station house. Besides the general duties connected with the care of the house, each life saver took his place at the look-out and at the patrol, which extended two and a half miles south and two miles north along the beach. The membership of the first paid crew was: Henry Groh, William Groh, Charles Lamphere, Oley Ellison, Garette Mmitinga, Martin Coin, Albert Heabing and Erich Nelson. A distinctive uniform, designed by Captain Groh and worn first by the members of the Sheboygan crew, met with such general favor that it was adopted by all the stations along the lake and is still in use. Thousands of dollars worth of property and scores of lives have been saved by the United States Life Saving crew at this port, since the location of the station here. The present captain of the crew is Joseph Dionne.